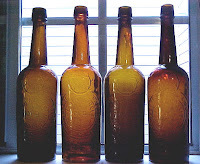 WesternWhiskies.com: JESSE MOORE - MOORE, HUNT & CO.
That bottle on the left in your picture: Is that one of those "stellar" examples of the Jesse Moore fifths? Although the 5th may be too, look to the right of the photo Anonymous and you'll see "stellar". Wow, what a beautiful reddish Moore flask with a very nice crude top! Sure seems odd that for as popular as this bourbon was for so many years then why don't we see more of the flask? One would also think you'd see the 5ths with more color variation. Mr. Hunt must of been very particular about the color shades of his bottles when ordering from the glass house. I agree G.P. As I stated in an earlier post, it's awfully odd we don't see the color spectrum on the Moore-Hunt bottles for as plentiful as they are. I think either Hunt or Moore must have been picky and only would accept "brown" bottles from the SF&PGW. Probably was Moore, since the only really greenish Jesse Sole Agents I've seen are from the newest mold (tool-tops,later style base). These were made shortly before G.H. 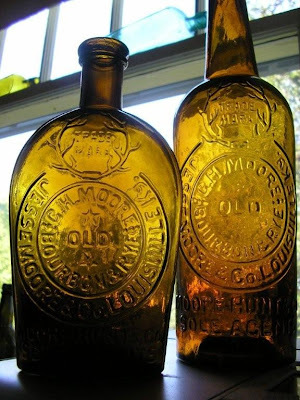 Moore was fading out of the picture and died in 1896 and shortly before the company consolidated with the Eastern firm of Jesse Moore & Co. Afer this, all the bottles ceased to have the words "Sole Agents" on them. I remember years back when a digger name David Brann pulled a super gnarly, greenish amber, non-vented Jesse from the Lincoln dump. What a bottle it was, just beaten to death whittled and a killer crookedy top! He moved th HI and the Jesse went with him. It's been over 30 yrs since he left, so the old bugger's prob'ly deceased. Who knows where that fifth is now. I know for a fact that I have not dug, or even seen, a Jesse Moore that is anywhere near the quality of that specimen.